Through the official website, wechat, weibo and other social platforms for professional visitors to timely provide the latest developments, authoritative industry information and related reports. Partnership with China Shipping, China ship Inspection magazine, Cruise & Ferry and other domestic and foreign etc. about 50 relevant industry websites, periodicals, micro-platform for extensive publicity and exhibition information push, news coverage before during and after the forum. 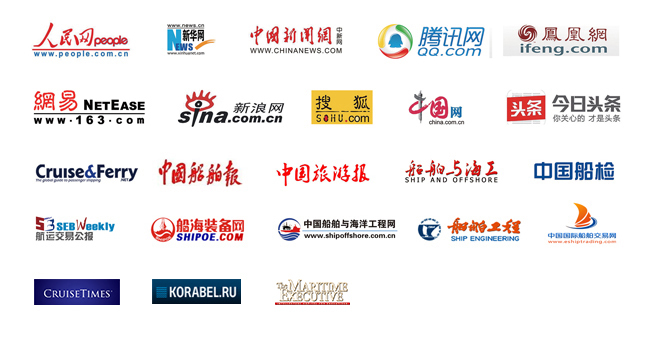 Publicity reports by People's Daily Online, CCTV.COM, Xinhua News, Phoenix TV, Sina, Sohu, Jiefang Daily, Wenhui Daily, Xinmin Evening News and other well-known media etc.